We are so excited to show you the awesome Survivor light, in a new low-profile design, redesigned with the "Total Internal Reflection" optic, providing a wider beam and optimum peripheral illumination. The Survivor is a light always loved by those who used it, and now it's been made to function better, be sleeker and lower profile, and have some added features that you're sure to love and appreciate. The C4 LED technology has four lighting modes. High, Low, Flash for signal, and Moonlight Mode, which provides a low-level lighting for battery conservation (runs up to 20 days!). The new Total Internal Reflection optic system provides a wider beam and and optimum peripheral illumination which aids in navigation and features two interchangeable smoke-cutter plugs for preferred beam pattern. The black plug significantly reduces peripheral light for when a tighter beam is needed, and the amber plug reduces peripheral light and eye fatigue caused by glare. Survivors have held the trust and respect of professionals around the world for a long time now. It's the flashlight for the toughest jobs and challenging situations. Your Survivor LED will never need to be replaced, and provides just the right light for all the various jobs (structural firefighting, EMS, extrication, technical rescue). Now with the new C4 Technology the light is stronger and more reliable than ever! Weather resistant, exceptionally durable--you cannot go wrong with the new Survivor. The great spring loaded clip on the back has a built-in ring that can easily attach to belts and harnesses making your access to your light convenient and easy. 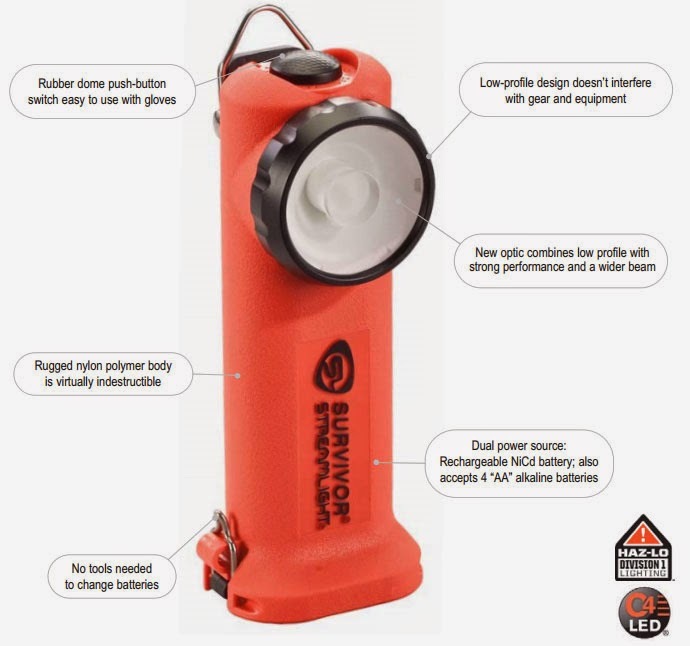 Available in orange, black and yellow, the new right angle low-profile Survivor Light can be yours today.